I'm putting tablets into a separate category from e-readers this year because I think their primary function is somewhat different. I think that most people tend to use tablets as more of a laptop replacement than as an e-reader. They tend to be bigger and bulkier and heavier than is comfortable to hold for any length of time. But at the same time, they're smaller and lighter and have longer battery life than most laptops so many people are finding them a relatively inexpensive option for traveling and/or a secondary computer. iPad continues to be the standard against which all other devices are measured. It's the multi-purpose device that will do almost everything a computer will do. The Apple iTunes app store not only has the most apps available but also the most desirable apps. When you hear about the latest wonder app that will make your life so much better, it's usually going to be available first on iOS (Apple's mobile operating system). iPad runs e-reader apps from OverDrive, Amazon Kindle, Barnes & Noble Nook, Kobo, Google Reader. Apple is making a play for the education market so there are multimedia interactive textbooks being created just for iPad. There are numerous magazine apps that are beautifully designed and provide stunning photos in the retina display versions. And it's a good gaming device. I think it's hard to go wrong choosing an iPad as a gift. It's got the edge on design, usability and apps. The major downside is the price. Current versions of the standard iPad start at $499 for the 16 GB wifi version. For those looking for non-Apple options, I prefer the Google Nexus line. These are Google's flagship Android devices. The picture is of the new Nexus 10 (10 inch tablet to compete with the standard iPad). The Nexus 10 starts at $399 for a 16 GB wifi version. Android tablets will run all the e-reader apps just like iPad. But overall, there are fewer apps in the Android app stores that are designed specifically for tablets. All that means is that some will be stretched a bit and not look quite as good. But a lot depends on what are your must have apps. 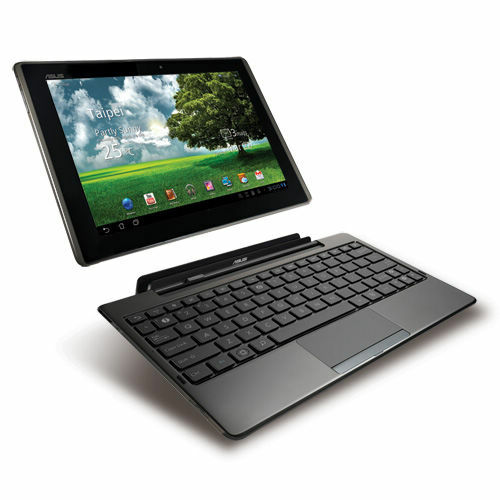 There are a lot of other Android tablets on the market as well, including the Asus Transformer (pictured above) that has a keyboard that attaches and makes the tablet into more of a laptop. Samsung and Acer make very nice tablets as well. All will run all the e-reader apps. Personally, I think that Android tablets are very competitive with Apple iPads. But there is the issue of ecosystems to consider. For anyone who is a Mac or iPhone user, they're probably pretty thoroughly integrated into the Apple ecosystem, meaning they have apps and/or iTunes content that they'd like to use on a tablet. In which case, you probably want to stick with iPads. If your gift recipient has an Android phone, it makes a lot of sense to go with an Android tablet either Google's or one of the others so s/he can use already purchased apps on it. Microsoft recently came out with its entry into the tablet market the Windows RT Surface. It's competitively priced at $499 for a 32 GB wifi. $100 more for the black touch cover. I haven't had a chance to try one out yet but just about all the reviewers love the hardware. And reportedly it's a good implementation of Windows 8 for tablets. 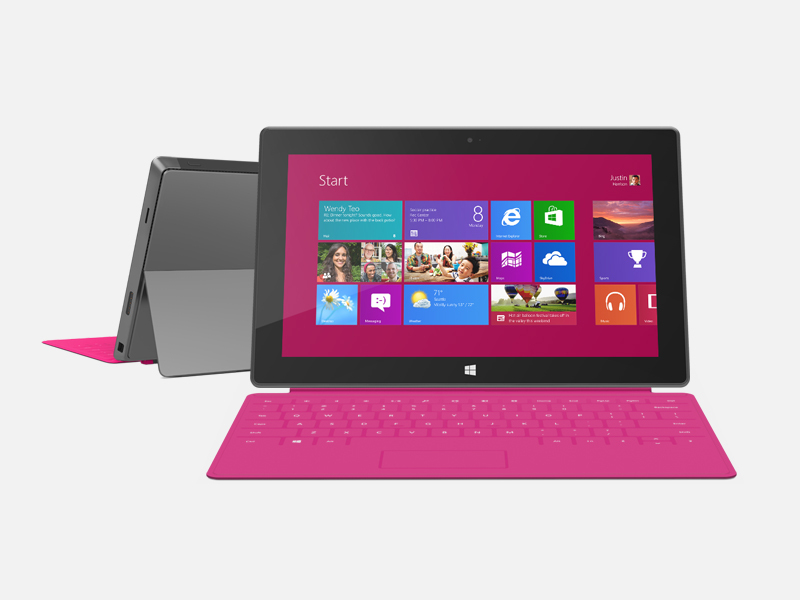 It also comes with a tablet edition of Microsoft Office Home and Student 2013. You can order the keyboard separately, either a touch one as shown or one with raised keys. Reportedly this is a necessary accessory if you're planning to actually use the Office apps. The key drawback at this point appears to be lack of apps. There is a Kindle app available, but so far nothing from Nook or OverDrive. Another thing to consider is that Microsoft is due to release the more full featured version of their tablet early in 2013. It will reportedly be significantly more expensive but also more like a desktop PC. It might be worth the wait. The 7 inch tablet seems to be the one with the most buzz around it this year, so this is where we'll focus. What I hear from a lot of tech journalists is that they absolutely love one or more 7 inch tablets and have set aside their full size iPads in favor of the iPad mini or Nexus 7. I was a bit puzzled by this until I realized that most of them have small ultralight laptops like the Macbook Air as their primary portable device. If that's you, you'll probably be most interested in this in between device. If you're looking at a laptop replacement, you may want to go back to the tablet posting. Apple recently announced its entry into the smaller tablet market with the iPad mini. It runs all of the larger iPads programs including all of the e-reader apps. The advantage is that it's smaller and lighter and less expensive. For people looking for an e-reader, it's more in line with the Nook Color and Tablet and Kindle Fire. But it's still more expensive. You pay the Apple premium. The iPad mini starts at $329 for a 16 GB wifi version. What you get for that price is entry into the Apple ecosystem with its hundreds of thousands of apps. But I tend to think that Apple missed the boat on this one. The iPad mini has the same display and processor as the iPad 2. That means it's the only current Apple iOS device without a retina display. To me, that's a deal breaker. But I know it's not important for many others. I've talked with a lot of people who are perfectly content with the fuzzy print of earlier iPads. I'd recommend going to a store to try one out before buying to make sure it's okay for you, and potentially for anyone for whom you're considering buying one. The smaller size does make it more portable but it will probably make reading PDF documents more laborious as you have to scroll. I have yet to try one so I don't know for sure, but I presume some web pages will be harder to read as well. I tried to check one out at Best Buy last weekend and was disappointed that the battery was dead on their one display iPad mini. Unless you absolutely have to have one now, I'd suggest waiting for the retina display version which is almost certain to come out with the iPad mini 2 sometime next year. Google's entry into the smaller tablet wars is the Nexus 7 (7 inch tablet) that has recently been upgraded. The Nexus 7 starts at $199 for a 16 GB wifi version. I've had a Google Nexus 7 original version for several months now. And I like it quite a bit. But I'm not really sold on the 7 inch form factor. For me, it makes it more difficult to browse the web as I'm always having to enlarge the type and scroll around. The difficulty with web browsing makes me use apps like the Facebook app far more than I would like to. But it does have good resolution and makes a pretty decent e-reader. That's largely what I use it for, to read non-Kindle e-books. Kindle Fires and Nook Color/Tablets - I'm going to show my bias by lumping these all together. Kindle recently announced a whole new generation of Kindle Fires - including an 8.9 inch tablet and an HD version of the smaller model. 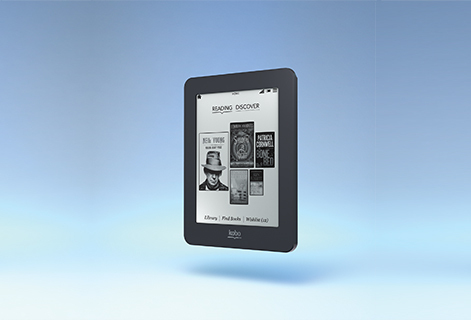 Nook now has a 7 inch HD and 9 inch HD+. But I think the primary difference is which ecosystem you're buying into. I categorize these as content consumption devices. In contrast to the tablets listed above, where the ecosystems are primarily related to the availability of apps with little or no restriction on content, with Fires and Nooks, you're pretty much tied into the Amazon or B and N ecosystems for everything from apps to e-books to audio and video content. This is particularly true for Kindle. Since Barnes and Noble isn't in the movie or music business, they do allow and encourage other third party apps. There are now OverDrive Media Console apps available for both through the Amazon and Nook app stores which should make it easier to browse for and download Mtlib2go books directly to the device. What they really have going for them is price and ease of use. 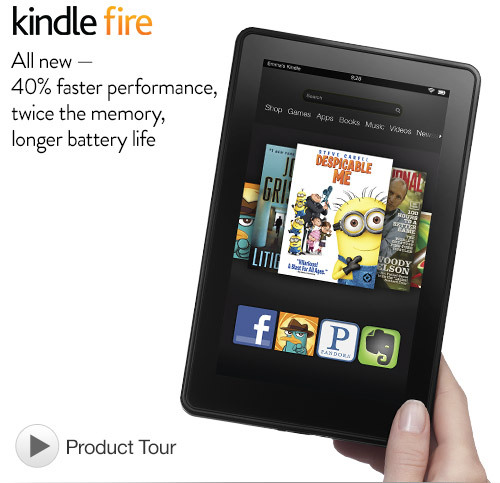 The Kindle Fire starts at $159 for the 8 GB wifi version with ads. The Nook HD starts at $199 for 8 GB wifi. And if you've got a person on your gift list who already owns a lot of e-content from Amazon or B&N, it could make sense to buy them a device which is optimized for that content. You just put in your account information, and presto, you have access to all of your content and an easy way to buy lots more. I think another plus for the Nook is that there is in store support, if you're lucky enough to have a Barnes and Noble store in or near your community. And I have to say that the Nook HD has beautiful clear and crisp screen resolution. I know some people who have either a Fire or a Nook and love them. I know others who received them as gifts last year and have never even taken them out of the box. Know your recipient. Personally, I'd skip this category entirely and either go with a dedicated e-reader or a real tablet. Finally the basic or dedicated e-readers. I continue to insist that these are the best bets for someone who really only wants an e-reader. They do one thing but do it better and better all the time. The new generation of e-readers are smaller and lighter and easier to hold. They have very long battery life, very good resolution and the screen contrast is improving all the time. 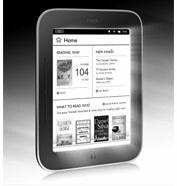 The photo above is of the Nook Simple Touch with GlowLight starting at $119. Amazon's answer is the Kindle Paperwhite, also starting at $119. I got a Kindle Paperwhite a couple of weeks ago. I continue to like the size and weight of dedicated e-readers. I think the light provides excellent contrast. The touch screen is responsive and easy to navigate and highlight. I know that a number of people I've talked with were interested in these illuminated screens so they could read in the dark. I still find it uncomfortably glary in a dark room at the lowest setting. But it does work well in a room with just a little light where it would be difficult to read ordinarily. As for other e-reader models, Kindle's lowest price basic e-reader currently sells for $69. The Nook Simple Touch sells for $99. The lowest price Kindle has ads. The Nook doesn't. I think either is a good choice. It just depends on where you want to buy your books. A plus for Nook is that you can read any EPUB book on it. But if you buy from another EPUB bookstore and/or use mtlib2go, you'll have to go through Adobe Digital Editions for DRM (Digital Rights Management). Also, worth mentioning is Kobo. You may recall that Kobo was the e-reader/e-book division of Borders. Borders is gone but Kobo lives on. Kobo has recently taken over the independent bookstore mantle that Google Books had for several years. So, that means I may well be buying more books from Kobo via some of my favorite bookstores like Powells and Tattered Cover. I can read them on my iPad and/or Nexus 7 via the Kobo app. Kobo offers similar hardware to Kindle and Nook. I think they boast the smallest e-reader, the Kobo Mini at $79.99 and they go up to a 7 inch tablet at $199.99. You might want to take their online quiz to help you decide which type of e-reader is best for you. I haven't used a Kobo Reader since the early days. At that time, the hardware wasn't up to the same level as Kindle or Nook but I think it's a matter of personal preference. They're reportedly available at a variety of retail establishments including Best Buy, Target and Sears. I didn't see one recently at Best Buy but there are a lot of others out there. And, finally Sony is still making e-readers. The current Sony Reader is a touch screen device selling for $129.99. I'm sure the hardware is comparable and it works with EPUB titles and mtlib2go. Other than that, it's lacking its own solid ecosystem. Finally, a note about wifi vs. 3G/LTE. Wifi means you need to be on a wireless network to access the Internet and/or download content directly to tablet/e-reader. Tablets and devices like Kindle Fires and Nook Tablets really want an Internet connection. As more and more people have wifi at home and/or have access to a number of public wifi hotspots, this works well for most people. The other option is to connect via a cellular data connection. When you buy an iPad, for example, you can choose whether you want to get your cellular data from AT&T, Sprint or Verizon. You set up a contract with that provider and pay them for a monthly data plan. This can be useful if you don't have wifi at home and/or if you travel a lot and don't want to have to worry about finding a wifi hotspot to get online. Some of the other Android tablets will also offer you a choice of carriers. If they don't, the carrier is usually AT&T. The Kindle Fire HD recently came out with an LTE version: "250MB a month for 12 months with a one-time payment of $49.99 - no monthly payments. If you need more data, 3GB and 5GB monthly plans are also available." 250 MB a month is only enough if you only plan to use the device to check email once in a while or download the occasional book. Otherwise you're going to need a contract with AT&T. And remember that streaming video is going to eat up a lot of data, if that's one of the uses you have in mind. The Kindle Paperwhite I recently bought was the 3G version. I had a Kindle 2 and found that it was useful to have 3G because it would enable me to get online quickly even when there was no wifi available. I was disappointed to find out that Amazon had plugged that perq. I guess I should have read the online documentation more closely. The 3G is only available to purchase and download content from the Amazon Kindle store. The browser only works on wifi. Drat! I could have saved $60. Another useful warning is that you may not be able to use all public wifi with the basic e-reader models. Some public wifi hotspots require you to access a browser and log on there. If the e-reader doesn't have a browser, you won't be able to log on. We discovered this at a library with the basic Kindle. And keep in mind that Amazon's Whispersync cannot be used to download Overdrive books. But if worse comes to worse, you can always download books to your computer and transfer them to any e-reader device. Hope this helps steer you in a useful direction for purchases this holiday season. Do let me know if you have any questions. And I'd love to hear your opinions of some of these devices in the comments. I'm sure others would as well.